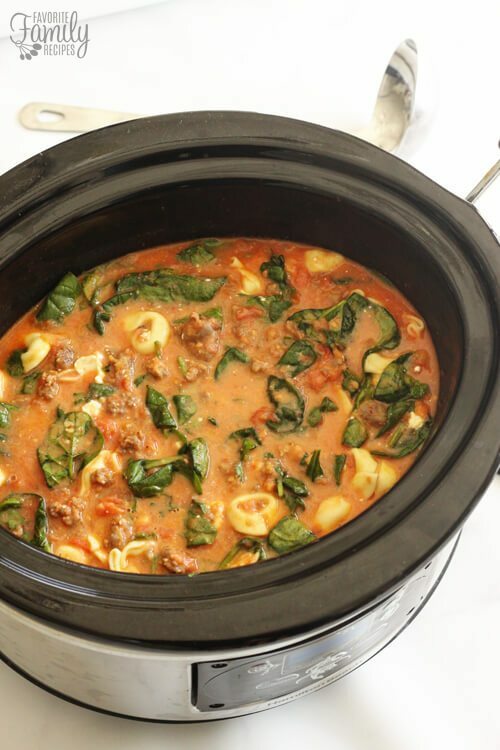 This Cheese Tortellini Soup is a flavorful, easy slow cooker meal. 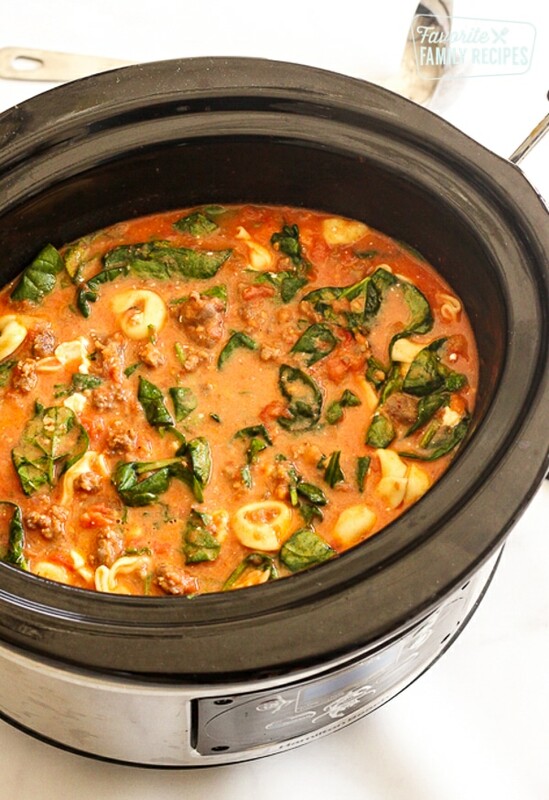 Tortellini, sausage, and spinach in a creamy tomato soup and slow cooked to perfection. I love using pasta in soup! I think it gives it such a good texture and it makes it more filling. Sometimes using soup as a main dish doesn’t fill me up, but with the sausage and the pasta, this soup definitely does. Make sure that you drain the sausage really well — the soup will turn out greasy if you don’t. This soup is so simple and it is easy to tailor to your family’s preferences. For a vegetarian variation, you can use mushrooms instead of sausage and substitute vegetable stock for chicken broth. If you like your food spicy, you can add a few shakes of red pepper flakes to the crock pot before cooking. To make it a little healthier, you can use turkey sausage and non or low fat cream cheese. If you use neufachtel (1/3 fat of cream cheese) be prepared that it doesn’t melt as well and leaves little curds. This soup pairs well with a green salad and a toasted bread that you can dip in the soup. Put all ingredients in the slow cooker on low heat. Cook on low for 4-6 hours, stirring occasionally if possible. Stir well and serve in individual bowls. This soup sounds great. Thank you and have a wonderful week! What size crock pot is needed for this? A 5-6 quart crock pot works great. Thanks for asking! Need more soup made with ground beef please. I’m on a very low budget. Can you help please? If you go to our “recipes” link at the top of our page, you can specify the meals you want to make and the ingredients you want to use and it will formulate a list of ALL our recipes that match those terms! You can check the box that says “soup” and also the one that says “beef” and filter those recipes and you will find what you are looking for 😀 Hope this helps! Do you put the tortellini in the crockpot when it is frozen or thaw it out first? I don’t think I would like fresh spinach cooked for so many hours. Wouldn’t it be better to add it near the end? The first time I made this, my son asked me if that was moss in the soup! So, I do add it near the end. It holds up better. This soup is delicious! Haha! No one wants moss in their soup! Adding it at the end is a great idea. I’m so glad you like the soup. Thank you! I made the in the crockpot the first time; never again as it doesn’t need to cook that long especially the tortellini. I make on the stove top basically after you cook the meat your just heating everything up and I melt down my cream cheese befor I put in my pot. This recipe makes 4-6 servings of soup (4 larger servings, 6 average servings). Thanks for asking! Can you cook this on the stove? thank you. How long will this last in the refrigerator? Can it be frozen if made in advance? This will last up to a week in the refrigerator. The pasta does not freeze well – sorry! Thanks for asking! We use bulk sausage in this recipe. Thanks for asking! Yes, of course! You will need a larger crock pot, or to cook it in two crock pots. Made this the other night and it was delicious, even without the sausage. Of course, the meat lover was a tad disappointed, but said it was still worth making again. Next time, I’ll add the sausage. I tried your cheese tortellini soup and it is the best thing ever! My Husband is a fan too. Made as written except added more garlic and Italian seasoning because my tomatoes were home canned without spices. Will make this again for sure! Thank you and can’t wait to try more of your recipes! So glad you and your husband liked this recipe! Thanks for taking the time to comment. We are excited you found us! haha love it! You can totally blend up those tomatoes! It will still be delicious! Let us know how they liked it! Made this for New Year’s. Super simple and little prep. I added a little tomato paste and more vegetarian broth. I used vegetarian Italian sausage. It’s delicious, My husband is a soup master and he loved it! Great ideas for making this a meatless soup. Thank you! Happy New Year! When you used Vegetable broth instead of chicken did you have to add salt?